German towns are expecting to see first self-driving buses by 2018. 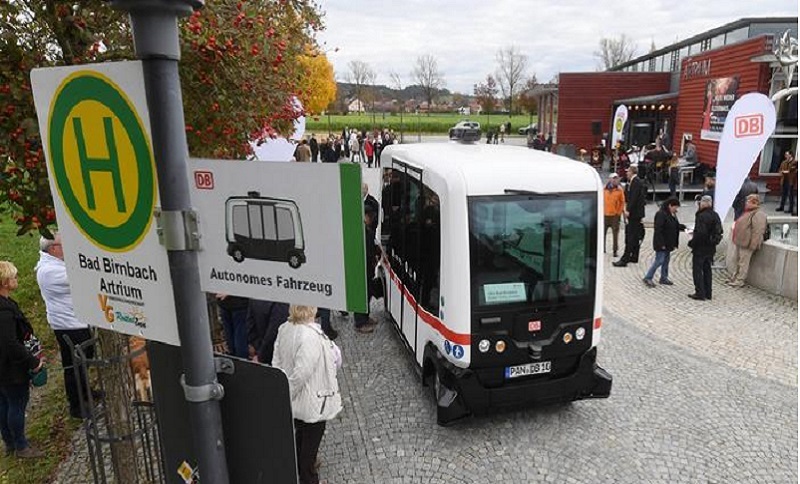 The testing of the automated driven buses is taking place in southeastern Germany. The 12-person bus designed by the French startup EasyMile has been introduced by German railway company Deutsche Bahn as the first self-driving bus that has been incorporated in Germany’s public transport system. The electric vehicle delivered its first passengers on Wednesday in Bad Birnach, Bavaria. The bus is equipped with sensors that can detect obstacles and automatically activate brakes and moves along a pre-programmed route with its speed initially limited to 15 kilometers per hour on the road with a 30 kph speed limit. In case of an emergency, a human driver can take control with a joystick since the bus is not yet capable of avoiding obstacles on its own. Richard Lutz, the head of the German railway giant Deutsche Bahn (DB) expressed his hopes that similar buses will soon operate like a private car service, traveling to passengers’ homes on demand and bringing them to the train station.